Hey everyone! The build has now been updated as of Update 41. Below is what I'm running currently, and an up to date write up giving my thoughts on playing this build in today's meta. If you enjoy this build and want to see more content from me please do me a favor and visit and subscribe to My Youtube Channel. I have hundreds of DDO related discussion, strategy, news and other videos. You can also Follow me on Twitter. Melee Cleric with as much DPS as possible while still meeting minimum standards of being a main party healer in Reaper and in Raids. Using Falconry with WIS to hit/damage with a focus on Two Handed Fighting utilizing Silvanus with Mauls. This build is able to both contribute solid melee DPS/Crowd Control and heal the party. Why pure over pally or fighter splash? The epic defensive fighting feat existing and Falconry enhancement tree existing make pally/fighter splashes less appealing than they were in the past. Also, focusing on healing is more important than in the past. This is not to say running something like 17cleric/3 pally is bad. It isn’t. It just makes for a more defensive build over offensive which is not this build’s goal. This build is giving up some survivability for better healing/DPS. If you want a tankier build that gives up some Falconry investment for investment in Sacred Defender, you can do that and it's not bad! I just think Falconry is too good right now to take points out of it in order to invest them in Sacred Defender. Also, pure gives better casting abilities and more spell points which is a nice perk. As well as the radiant servant capstone which isn’t that great – but it’s decent. PDK and Scourge are the clear two best choices as they both are able to take Silvanus and both have some nice low hanging fruit on their enhancement trees. Human is worse than PDK since they can't access Silvanus, but has the advantage of both being a free to play race and not costing the player any DDO points to LR out a forced first level. Human will have lower melee DPS than PDK but basically equal in all other respects. So only choose Human if you want to run this build on the cheap. Which is better, PDK or Scourge? I think they’re about equally viable. PDK gets a free feat, while Aasimar Scourge has a better racial enhancement tree and an inherent +2 to WIS. As a cleric you don’t need Scourge’s healing hands, but the tier 2 doublestrike and spell points/spell pen is nice. But keep in mind any points spent in the Scourge tree take away from points you can spend in the Falconry/Radiant Servant trees. Decide which enhancements you really want before deciding on race. Both are good choices, though if you go Scourge you’ll have to either drop one of the feats listed below or splash a fighter level to get another feat. My personal preference is PDK. And again, keep in mind that both these races are iconic and have a forced forced level that is not cleric, so you'll have to LR that level out. 1st priority WIS, max it. Next priority is CON and then CHA/STR. I’m not listing an exact split because it depends on what tomes you have. It is important to be aware that you’ll need enough base STR (points invested in the stat + STR tomes) to meet feat requirements. So keep that in mind, more info on that below. Invest as little in STR as you can to meet feat requirements. CHA isn’t all that important as it only powers numbers of turns for this build. So a focus on WIS/CON with minimal investment in CHA/STR is best. If Scourge race, drop Intensify. Mass Frog can be swapped for Deific Warding if desired. Feat order may need to be swapped around depending on what STR tome you have and/or how much you invest in STR initially. You need a total of 13 base STR for Power Attack, 15 for THF feat and 17 for ITHF and GTHF feats. The following leveling order assumes you start with 13 STR at character creation and have atleast a +4 STR tome. This is the domain you should take because it gives the Holy Sword SLA, giving a +1 bonus to critical damage range and critical damage muliplier. That makes this is our clear choice of domain because it's generally the best for increasing our melee DPS. We don't need to give up DPS for even more healing by taking a domain like the Healing Domain. The healing abilities this build has is already sufficient to serve as a party healer. Simply the best domain for Melee DPS, hands down, making it the obvious choice. Just like with our Domain choice, we don't need to pass on the best melee DPS destiny in order to get more healing from a tree like Crusader or Exalted Angel. The build will have plenty enough healing without it, sacrificing using Dreadnaught just for more healing is not necessary and not worth it in the vast majority of situations. If you’re in a situation where you will be ONLY healing, Sentinel for more survivability may be worth swapping to, but that kind of situation should be rare. Tier 4 twist - Sense Weakness (Fury) – Your main role in the DPS department is off tank single target DPS which compliments this. Especially when it comes to beating down raid bosses and other large HP mobs. You also get an additional 30% damage to helpless mobs with this twist, which synergizes very well with your avian attacks from the Falconry enhancement tree, which will constantly be making monsters helpless. Tier 3 twist - Renewal (Sentinel) – Simply amazing for healing. Lets your SP last forever, and is incredibly useful for tank healing. I use a tier 3 twist on it because it’s simply too invaluable as a very low SP cost ranged healing option to complement aura/burst. And remember, the goal of this build is to be an effective raid/party healer so we need to be able to do that in a pinch if needed. If you’re willing to blow through many spell point potions in those really tough healing situations and use heal spells instead of renewal, you can ignore it if you'd like. The rest of your twists are more flexible. Some great options include Unearthly Reactions (Magister), Brace for Impact (Sentinel), Endless Faith (Angel), Healing Power (Angel) and Wild Weapons (Fury). Not required for this build, it is first life friendly, but they obviously help. The most important is 3x Martial past lives for 9% doublestrike. Paladin, FVS, Wizard, Asimar/Human past lives are all nice as well and make the build better. They are optional however. In Reaper, focus on debuffing/CC’ing enemies with falconry attacks while healing the party. But healing is generally your first priority. Stay back and heal in Reaper when it gets too dangerous for you to be up front melee'ing. The most important skill by far you'll need to master when playing this build is to know when to melee and when to step back and heal. You have to get a feel for the party and play accordingly. You don’t want to get too aggressive and die, but you also don’t want to be a liability and not contribute in terms of offensive to your party. Some parties (and Reaper mode particularly) will require you to heal more than melee, while lower difficulties and very self sufficient parties may let you focus almost soley on CC and DPS. Epic Defensive Fighting goes hand to hand with this. To play this build optimally you will need to constantly be turning it on and off depending on the situation, because you want the HP bonus when you melee but it majorly handicaps your healing range. Sometimes this doesn't matter when radiant aura and radiant burst are more than enough to heal the party. But sometimes it isn't, and sometimes it may not be practical to have a handicapped healing range when the party is more spread out. So when you need to focus more on healing you'll need to switch it off and be more weary of how much aggro you're receiving from monsters. Why don't you use Warpriest? Short answer, Falconry is just a better option in basically every area that matters. Even after the pass this year, Warpriest in my opinion fails to be worth putting a substantial investment in on any kind of melee cleric compared to spending those points in Falconry. I made a whole youtube video explaining why. Watch it if interested. If you are looking for my old 15 cleric/4 paladin/1 fighter split, the old post is archived here. Thanks for posting the build. Love the channel; long time listener, first time caller (watched the EE Chrono run, grats!). For a heroic PL, what leveling order would you recommend? I get that this is a mainly epic build but I'd love to try it out & next life is Cleric. NB: I won't be taking 18 or 19, just straight to 20. Would it be worth taking Stunning Blow in place of something like GTHF? Thanks! The EE chrono solo was a serious pain, but got through it. Lol, probably not ever doing it again though! Go with the fighter level early, level 1 or 2. You have to have it for martial proficiencies - plus you want that haste boost as soon as possible. Saves and bloated HP from my experience aren't that vital until epics, so I'd take all cleric levels next to get my spells as early as possible until you are 15 cleric/ 1 fighter. You especially want to not put off blade barrier or your radiant servant abilities. Then take the paladin levels. I actually tried out taking stunning blow a year or two ago - at one time I was a Half Orc 17 cleric/2 fighter / 1 wizard and geared for it. It's nice to have, especially in epic hard. But overall my conclusion was it requires too much investment to get your DC up high enough for it to be worth it. Probably giving up a gear slot for exceptional stunning, twist slot or destiny tree points, APs for stunning enhancements, not to mention the feat. And even still it's really hard to get it reliable in the high EE stuff. It's just too much to give up in my opinion. With the epic boots of the innocent I'm wearing now having stunning on them it certainly helps since I slot that anyway. Still don't think it's worth it, especially with all the immune undead we have at endgame now. I don't think it would be all that helpful in heorics, mobs don't have a lot of HP until epics - someone else might disagree. Last edited by axel15810; 01-18-2015 at 02:02 AM. In the right spot at the right time. Currently running CLR11/PAL3/FTR1 @lvl15 Purple Dragon Knight. Just some casual newbie advice added. I have run multiple Melee Clerics. This will be similar with CLR15/PAL3/FTR2. In heroic I barely use rest shrines while other caster clerics are constantly running out of mana. They cast Blade Barrier a lot. I can tell you the damage output and large swings from Cleave, Great Cleave and then Exalted Cleave are the same as casting Blade Barrier if you use a Falchion like I do with lots of critical going off. This build has enough Healing output for Heroic levels that a lot of Devotion is not needed for lvls1-20. Radiance and Radiance Lore are more useful in Heroic for Divine Punishment. In epic it is easier to gear Devotion and Impulse with Radiance using consolidated gear with 3-4 buffs on each. You will also need a nice Combustion along with Combustion lore in Epic for Divine Crusader. In Heroic I just use a Belt of Seven or a Potency item for around 40+ spell power, and only carry a best Radiance spell power item and Radiance Lore cause Divine Punishment is about the only thing that drains my mana against Bosses. In Heroic Deadly, and especially Accuracy are important if you leave Power Attack on. Seeker helps if you can fit it in. I find myself using Divine Power items less with a deeper Melee splash, but if in less of a healing role in a group spending time doing a quick gear swap to use Divine Power helps your melee attack speed by increasing your BAB to character level. You get a lot of Turn Undeads from this build and the Pally turns stack with Cleric turn addition enhancements. Running with 17 turns and they regenerate. I delayed my level up to run some VON flagging in House K for more XP. With all the gear you will need to run Coinlord quests first for that Iconic toon you just made to get inventory slots. These melee Casters require lots of gear. The Trinket and Hat for PDK are nice for healing amp and fortification. Lordmarch quests for more Coinlord favor and tweaking and some XP. There is your free inventory. Then off to VON Flagging holding off on lvl16 for House K and bank slot and some XP at lvl15. At lvl15-16 Gianthold flagging for nice XP and Collapsible Portable Hole for second inventory slot. Now it is off to VALE for XP runs with my PARALYZING FALCHION!!! Last edited by firemedium_jt; 01-18-2015 at 11:03 AM. Your lack of healing amp not my problem. Please buy and use your own remove curse pots in combat, so I don't waste mana. Not my job. Because from posts I've read it's mostly a wash in terms of DPS since you have to turn off power attack to use it. And since this is a THF build that's 10 damage per swing. If you've seen math that shows otherwise, please post it I'm all ears. I've looked myself but haven't come across anything. Did not know that. It was a suggestion that was made to me, but I like PA better. Never used Precision. That is a shame. Precision is for fort-mob quests. (Undead, constructs, plants, elementals.) It is hand-down superior dps compared to power attack against those mobs. It's not even really close. To the OP, any consideration for going warforged so that you could take warpriest righteous weapons line with greatswords? Can you link math? Like I said in the prior post I've yet to see any math to back this up for a THF build. If you can link some I'm all ears. Nope, to me the warpriest tree and the righteous weapons line just isn't very good. Not worth the APs. Not to mention TF Falchion has the better crit profile, I wouldn't want to be stuck using greatswords. And warforged hurts your aura, loses you a feat (actually 2 feats since you'll have to take adamantine body) and gives you -2 CHA and -2 WIS. And the construct immunities aren't a big deal since clerics have stuff like greater restore and busts to easily deal with it. I think human is clearly better. Last edited by axel15810; 01-18-2015 at 12:10 PM. I haven't seen any to link, but it's not overly difficult to run the numbers now. And now I'm kind of curious as well. Let's call your base damage "x". We have a 95% chance to do base damage, and a 30% chance to do an additional (1x) base damage over and above that. So against 0% fort, power attack does an extra 12.5 every swing. Solid in heroics, kind of meh at endgame. That means if your base damage (left-most number only) is 128, you do the same dps with either. Higher than 128 and precision does more dps. Lower than 128, power attack does more. So the more bypass you have, the better power attack looks. Precision is still better at a fairly low number for endgame. EDIT: Totally spaced seeker. That complicates the math a bit, and favors precision. Last edited by EllisDee37; 01-18-2015 at 01:24 PM. If your non-crit base damage (left-most number only) is above 90, precision is more dps against 100% fort mobs. Last edited by EllisDee37; 01-18-2015 at 01:50 PM. Very nice video, Axel. I'm using a similar build on a static group toon; I think my enhancements are not exact, and I have no SoS, but it does decent damage. +1, you must have spent a good amount of time on that. I'm a little confused on what some of your numbers represent but when I get some more time I'll look through it more thoroughly. Very cool, hope it works out for you. The heroic SoS is nice for heroics (I never did get that epic SoS shard). Greensteel LIT2 works great as well though. And yeah sorry it took me so long to get this video out. I know I've been promising it for a while. I spent some time experimenting with different enhancement combinations before deciding on this one which was part of the reason why it took so long. Also I wanted to get to level 28 and get that EE Chrono solo done to prove this is a good build before putting it out there. Last edited by axel15810; 01-20-2015 at 12:58 PM. Best place to start is the Precision breakdown in the second post with the colors. It's the most straightforward, where "x" is equal to your base damage. The power attack formula is the same, except it looks much uglier because "x" is replaced with "(x+2.25+10)" to represent the extra 10 damage power attack does plus the extra 2.25 you get from +0.5[W] with Improved Power Attack. Love the post and the video.... lots of good info there. I did have one question about the build though.... at what levels do you take the various classes?? I'd really like to try the build out but being a new player, I really have no idea about when to take what class. 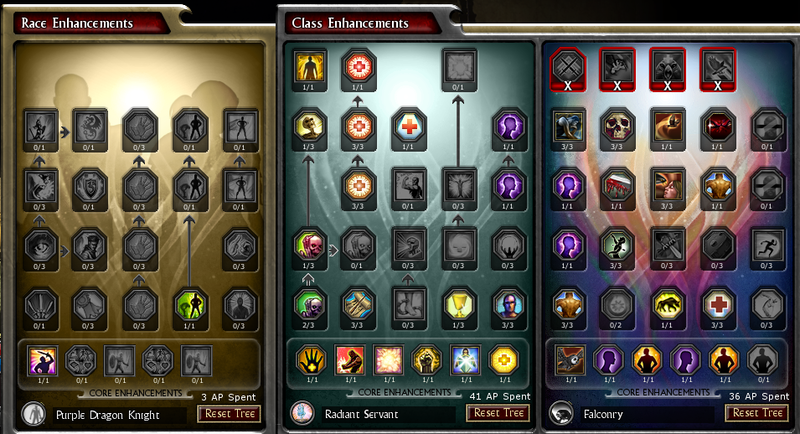 The enhancements I would imagine would be pretty straight forward.... try to get to 32 in The main cleric tree by level 12 for the radiant aura heals and then fill in the rest as you can. Is that a correct assumption? Definitely take the fighter level very early. You need it for martial proficiency and it's awesome to get that haste boost and extra feat early. The paladin levels are more flexible. I put them off because I don't find saves and the +20% HP very important until epics. And you want your cleric spells like blade barrier as early as possible. And yes I try and get aura as soon as possible but my biggest priorities are to get bursts, divine might, haste boost and damage boost quickly. If the aura has to wait an extra level I'd be OK with it rather than give up divine might, haste boost or damage boost. Last edited by axel15810; 01-21-2015 at 12:55 PM. What level are you starting out? CLR11 ASAP after FTR1 cause you are a Cleric after all and Heal, Divine Punishment, and Blade Barrier are nice at mid lvl. PAL3 for Saves and HP are useful at these mid to high lvls. Low to mid lvl the FTR1 and CLR11 come in real handy. The Saves from Pal3 is not really needed this early, and you give up too much delaying CLR11. Lvl6 spells are the best and very powerful along with Divine Punishment for Heroic even on a Melee Cleric. There are some arguments supporting on a 2hdr taking Cleave and Great Cleave early, but really they are overkill for low lvl and really shine when you get nice Prefix weapons at mid to high lvl like Paralyzers against mobs. After Power Attack and Improved Critical Slash for melee you need Empower Healing, Maximize, and Quicken ASAP, IMHO. Max helps your burst healing at low lvl. Radiant Burst is your best mass healing at low lvl. Until you can get Radiant Burst you can get Ameroliating Strike at around lvl 4-5, so invest in the War Priest tree early then at CLR6 dump it for Radiant Burst. Until you get Radiant Burst and Aura invest more in other trees like Human is a small investment along with Kensi and FTR Haste. Huge returns for those Tier 1s in Human and FTR. Always have Human Healing Amp, Human Damage Boost, and FTR Haste. Then move around the other trees. Get Aura ASAP. It is your best healing thing to do. The best fortificaiton item you can find or buy at auction house. Low lvl best Accuracy, so you leave Power Attack on all the time. Not as important at mid to high lvls. Deadly if you can fit it in a low lvl and a must have for mid to high levels. My favorite weapon for 2hdr builds are Keen Falchions with Power Attack at low lvl rock. You will critical for double damage a lot. Everbright weapons for slime and rust monsters. I play mostly melee clerics and would have no problem helping a fellow healer out on my server. Last edited by firemedium_jt; 01-21-2015 at 05:20 PM. I'm almost done farming tokens to TR my redundant HealBot cleric... This looks almost perfect. Think I'll try and get a few more SP as I tend to solo mostly. I have a bunch of random tomes too so can probably get turn this into an awesome build for my purposes. Last edited by AbeonTech; 01-25-2015 at 04:22 PM. Don't forget Owl's Wisdom potions in the marketplace, ML2. They can get you from 2 to 4 without issue. Yep, like above said Owl's wisdom pots should solve any early minimum WIS issues.